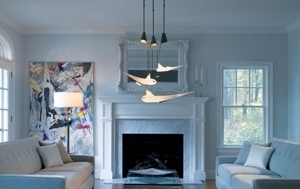 Think of a light fixture as an objet d’art for your home. What is the best height for a sconce in a room with a 9-foot ceiling? The recommended minimum height of a sconce for any ceiling is 5½ feet. This height works well for 8- or 9-foot ceilings. However, some designers choose to place wall sconces at 5 feet, 9 inches high with a 9-foot ceiling. What is the maximum recommended size for a drum pendant light hanging over a 36-by-54-inch dining table? A rule of thumb for sizing a chandelier over a dining table is that the fixture should not exceed the width of the table less 12 inches. For a 36-inch wide table, the fixture should not be more than 24 inches in diameter. Create a room for living by carefully choosing light fixtures that not only illuminate well, but also add aesthetic appeal. By creating an artfully balanced space, you create a comfortable and more enjoyable space. Use at least four layers of light to create a space that can smoothly transition from lively to low-key at the touch of a switch. While a dramatic fixture or eye-catching pendants may set the tone, additional lighting (for example, recessed and track lights, sconces, portables, etc.) may be needed to create appropriate illumination and comfort zones. For more ideas for lighting your home, visit AmericanLightingAssoc.com. For expert advice and the best selection, visit your local ALA-member showroom. Lighting is possibly the most powerful tool you have when it comes to interior design. Why invest in beautiful furniture, rugs, paintings and accessories if you are living in the dark? When looking for a light fixture, think of yourself as a curator looking for a perfect piece of art. Like art, a fabulous fixture can make a strong design statement as well as provide illumination for your space. Don’t be afraid to add interest by using a modern fixture in a traditionally decorated room or vice versa. Find one special piece and build your room around it. Find your artistic inspiration at a nearby ALA-member showroom.